En YouTube live streams will soon include automatic captions explican que YouTube ya incorpora la posibilidad de crear subtítulos en tiempo real para las emisiones en directo (live stream). Por ahora solo está disponible en inglés. The feature hasn’t been enabled for the channel, as we are slowly rolling out to channels with more than 10k subscribers. Channel is streaming in ultra low or low latency (such as a mobile live stream). Live automatic captions are only available for normal latency streaming. The language in the video is not yet supported by automatic captions. The video has poor sound quality or contains speech that YouTube doesn't recognize. There are multiple speakers whose speech overlaps or multiple languages at the same time. 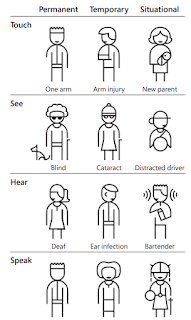 En Inclusive Design at Microsoft se puede encontrar información sobre el compromiso de Microsoft con el desarrollo inclusivo. El manual es muy interesante por dos cosas. Por un lado, porque el documento está publicado con una licencia Creative Commons AttributionNonCommercial-NoDerivatives (CC BY-NC-ND). En junio de 2014, el WebAIM lanzó la primera encuesta para profesionales de la accesibilidad web. Los resultados de la primera encuesta del WebAIM para profesionales de la accesibilidad web mostraron algunos datos curiosos. Por ejemplo, en la pregunta sobre los lectores de pantalla se observó una disparidad respecto a los resultados obtenidos en la encuesta a usuarios de lectores de pantalla. 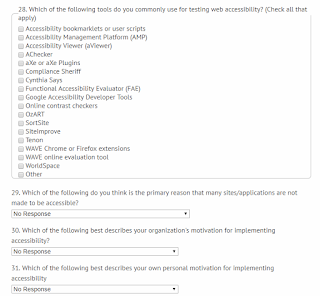 Ahora el WebAIM ha lanzado Survey of Web Accessibility Practitioners #2, que estará abierta hasta el 30 de abril de 2018. 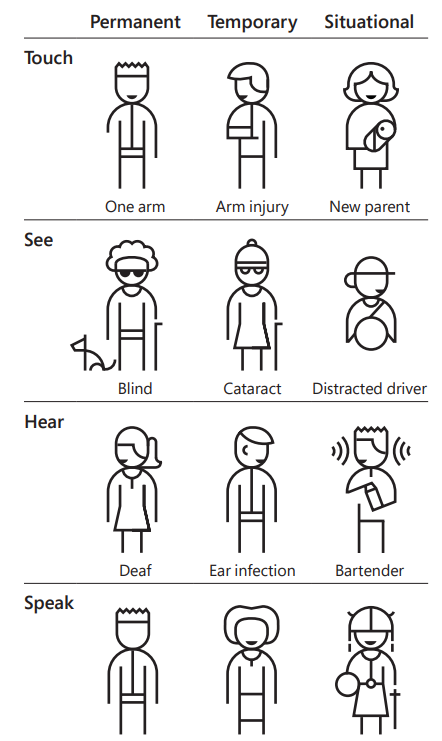 Muy interesante el artículo The new guidelines in WCAG 2.1 explained, que explica las novedades que tendrá la nueva versión de Web Content Accessibility Guidelines que seguramente se aprobará este próximo verano. Universal web accessibility helps us create sites that are usable by the widest, most diverse audience, rather than creating bolt-on solutions that might benefit one group at the expense of another. Un truco muy útil para los que usamos un lector de pantallas para revisar la accesibilidad de las páginas web: Shut up JAWS. Accessibility is one of those things we all wish we were better at. It can lead to a bunch of questions like: how do we make our site better? How do we test what we have done? Should we spend time each day going through our site to check everything by hand? Or just hope that everyone on our team has remembered to check their changes are accessible? This is where automated accessibility tests can come in. We can set up automated tests and have them run whenever someone makes a pull request, and even alongside end-to-end tests, too. 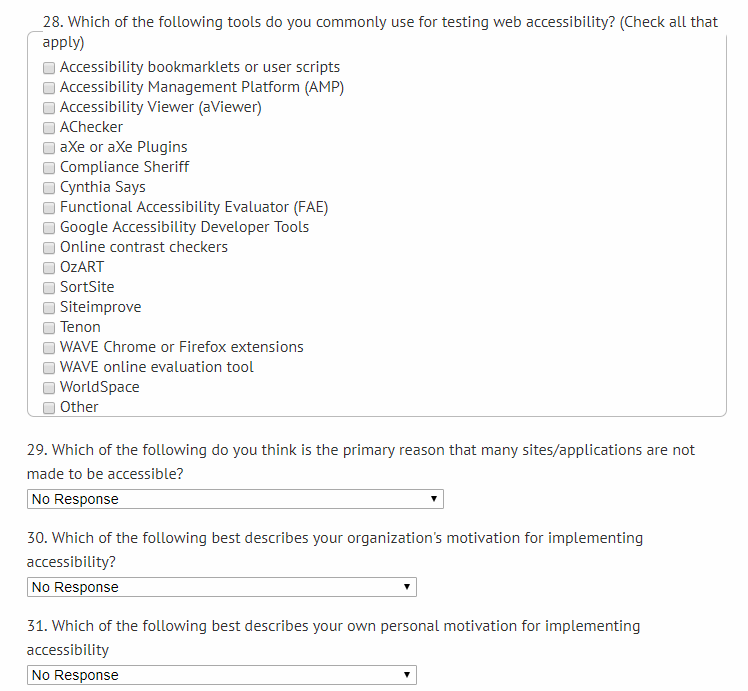 Automated tests can’t cover everything however; only 20 to 50% of accessibility issues can be detected automatically. For example, we can’t yet automate the comparison of an alt attribute with an image’s content, and there are some screen reader tests that need to be carried out by hand too. To ensure our site is as accessible as possible, we will still need to carry out manual tests, and I will cover these later. Authot es una plataforma web para la generación automática de transcripciones y subtítulos para vídeos.